I’ve been watching the baby powder/talc trials closely for the past several years. They feature some of the world’s best lawyers, and they are pushing the boundaries of scientific evidence. For anyone in the litigation business, the talc trials, as well as the trials involving the alleged cancer-causing properties of Monsanto’s herbicide Roundup, form a fascinating window into how big-ticket cases are being tried right now. In both lines of cases, plaintiffs are showing early dominance, and I think the defense accordingly needs to adjust both how it handles demonstrative evidence and how it deals with scientific evidence. Interestingly, both of these types of trials can be watched on the Courtroom View Network (CVN). I have long advocated that trial attorneys should be watching other trial attorneys on CVN because there’s almost no other way to see today’s great lawyers in action. In the most recent talc trial, famed plaintiffs lawyer Mark Lanier of Houston took on Johnson & Johnson, which makes talcum powder products. He asserted that his clients, 22 women who used the products, were exposed to asbestos found in talc and that this exposure caused them to contract ovarian cancer. The case is notable for many reasons. The result was certainly remarkable as this past July, plaintiffs were awarded nearly $4.7 billion in damages by a jury in a Missouri state court. The case is also one of the most high-profile cases to utilize genetic evidence. And that aspect was particularly interesting to me as this is an area that A2L and its partners at Innovative Science Solutions have been discussing for the last couple of years. We even held a conference on the topic of the use of genetic evidence in civil litigation. So let me discuss two aspects of this case. First, while I am not an expert in analyzing genetic evidence in civil cases, I do understand how to use it and how to present it. In this case, the defense was clearly reluctant to use genetic evidence, and it only lightly cross-examined plaintiffs’ genetics expert. 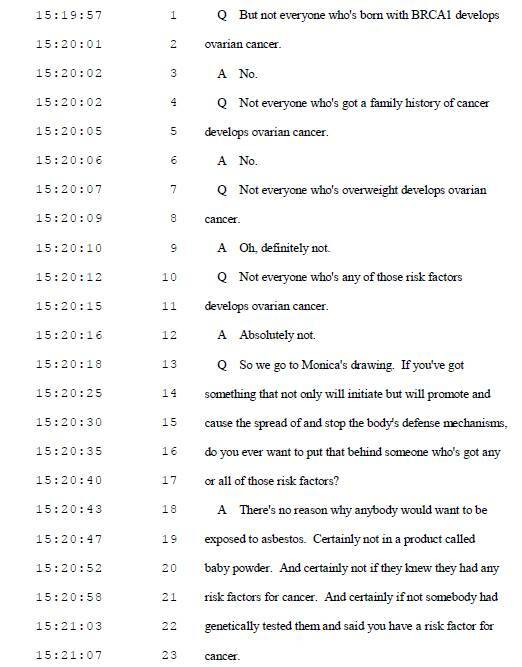 I don’t know for sure, but I’ll speculate that like other defendants, Johnson & Johnson may have feared that by presenting genetic evidence as a defendant it would position the plaintiffs as a so-called eggshell plaintiffs, making liability easier for plaintiffs to prove. See takeaway #6 in this article where we discuss why this thinking is specious. Whether or not defendants were concerned about the role of genetics in conveying to the jury that these may be eggshell plaintiffs, Lanier appeared to adopt this approach anyway. He utilized genetics to affirmatively allege that the plaintiffs were especially vulnerable to the effects of talc. This highlights an apparent growing trend of the plaintiff utilizing genetics to demonstrate plaintiff susceptibility to alleged toxins and a need for the defense to effectively address and rebut this assertion. I haven’t seen that tactic before. and similarly situated defendants must get ready for this tactic in other cases. A good place to start would be talking to my friend and frequent collaborator Dr. David Schwartz at Innovative Science Solutions who is doing pioneering work with the group ToxicoGenomica. The second element of this trial that I found fascinating was Lanier’s use of demonstrative evidence. In most big-ticket litigation demonstrative evidence is exchanged a day or so before it is used, to allow for objections to be made. 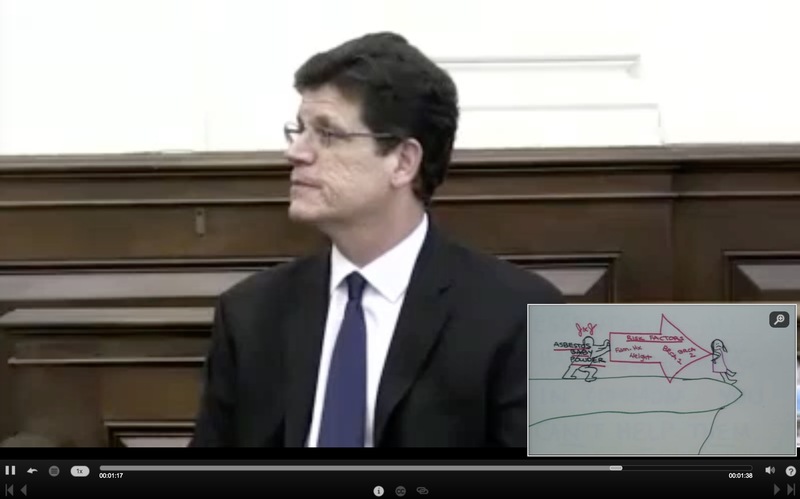 Clearly, Lanier has figured out a workaround by drawing (or having his colleague draw) a highly prejudicial demonstrative that for whatever reason the defense did get excluded. It’s the featured picture in this article, but let me show you what I mean in this clickable video clip and transcript below from our friends at CVN. Here Mark Lanier perfectly combines the eggshell plaintiff approach with an objectionable piece of demonstrative evidence to powerfully drive a point home. His message is that some people are genetically more susceptible to cancer-causing agents like asbestos and that Johnson and Johnson and their baby powder products pushed plaintiffs over the cliff where cancer happens.